For the Jamaican record producer, see Joe Gibbs (producer). For the Grenadian cricketer, see Joe Gibbs (cricketer). Joe Jackson Gibbs (born November 25, 1940) is a retired American football coach, NASCAR Cup Series and NASCAR Xfinity Series team owner, and former NHRA team owner. He was the 20th and 26th head coach in the history of the Washington Redskins (1981–1992, 2004–2007). Known for his work ethic, Gibbs constructed what Steve Sabol has called, "The most diverse dynasty in NFL history", building championship teams from players who had mediocre to average performance while playing for other NFL teams. During his first stint in the National Football League, he led the Redskins to eight playoff appearances, four NFC Championship titles, and three Super Bowl titles over 12 seasons. Gibbs is the only head coach to have won Super Bowls with three different starting quarterbacks. After retiring at the end of the 1992 season, he switched focus to NASCAR team Joe Gibbs Racing, which has won four NASCAR Cup Series championships under his ownership. On January 7, 2004, Gibbs came out of retirement to rejoin the Redskins as head coach and team president, signing a five-year, $28.5 million contract. On January 8, 2008, Gibbs announced his final retirement from coaching. He remained with the Redskins organization as "Special Advisor" to the team owner Daniel Snyder. Born in Mocksville, North Carolina, Gibbs is the son of Jackson Ceufud (1916–1989) and Winnie Era (Blalock) Gibbs (1915–2000). Joe graduated from Santa Fe High School, Santa Fe Springs, California, in 1959 where he was the star quarterback. Gibbs attended Cerritos Junior College and then San Diego State University (SDSU), coached by Don Coryell. Gibbs graduated from SDSU in 1964 and earned a master's degree in 1966. Gibbs began his career with a stint as offensive line coach at San Diego State under Coryell (1964–1966). He held the same position under Bill Peterson at Florida State (1967–1968) before serving under John McKay at Southern California (1969–1970) and Frank Broyles at Arkansas (1971–1972). Gibbs then advanced to the National Football League, hired as the offensive backfield coach for the St. Louis Cardinals (1973–1977) by head coach Don Coryell. After a season as offensive coordinator for the Tampa Bay Buccaneers (1978) under McKay, Gibbs rejoined Coryell with the San Diego Chargers (1979–1980). As the offensive coordinator for San Diego, Gibbs spearheaded the highly successful "Air Coryell" offense. Using a sophisticated passing attack, the Chargers and quarterback Dan Fouts set multiple offensive records during Gibbs' two seasons there. Remarkably, the Chargers averaged more than 400 yards of offense per game during their 1980 season. After 17 years of coaching as an assistant, in 1981 Gibbs was offered a job as the head coach of the Washington Redskins by Redskins owner Jack Kent Cooke. After firing then-head coach Jack Pardee, Redskins owner Jack Kent Cooke was on the lookout for candidates. When general manager Bobby Beathard pointed out the forty-year-old San Diego assistant coach, Cooke, who had a keen eye for spotting leadership and an ability to teach (he also gave Sparky Anderson his first managerial job), saw Gibbs' potential during an interview and hired him. Gibbs' first season with the Redskins started inauspiciously when the team lost their first five games. Cooke famously expressed confidence in Gibbs, declaring that the team would finish 8-8. The losses and Cooke's confidence served as a catalyst, and the newly motivated team improved and reached an even 8-8 record in 1981. Gibbs' second season with the Redskins (1982) realized the dreams of the entire Redskins fanbase: an NFC Championship Game and a Super Bowl victory. In a strike-shortened season, the team advanced through the playoffs and won Super Bowl XVII by beating the Miami Dolphins 27–17, avenging Washington's loss to Miami in Super Bowl VII. The following season (1983), Gibbs' surprising success continued with a 14–2 regular season record and a win against the Los Angeles Rams 51–7 at home, in the divisional round of the playoffs. The Redskins once again won an NFC Championship, defeating the San Francisco 49ers 24–21 on a last-second field goal (aided by a controversial pass interference call), advancing to Super Bowl XVIII. The Redskins were installed as a 2-point favorite by Nevada books going into the game, but were soundly defeated by the Los Angeles Raiders 38–9. The 1984 Redskins won the NFC East with an 11–5 record and hosted a home playoff game against the Chicago Bears but lost 23–19. Gibbs coached the 1985 Redskins to a 10–6 regular season record and barely missed the playoffs. During the season Joe Theismann broke his leg during a Monday Night Football game against the New York Giants, but the Redskins still won the game with Jay Schroeder at quarterback. In 1986, Gibbs coached the team to a 12–4 regular season record and defeated the Los Angeles Rams 19–7 in the wild card playoffs, then upset the defending champion Chicago Bears 27–13 in the divisional round, on the road, to get back to the NFC Championship game against the New York Giants. The Giants would win 17–0. It was to be Gibbs' only NFC championship game loss. The 1987 Redskins made the playoffs and again defeated the Chicago Bears 21–17 on the road in the divisional round, then beat the Minnesota Vikings 17–10 at home in the NFC Championship Game, then at Super Bowl XXII, they rode the arm of quarterback Doug Williams to blow out the Denver Broncos 42–10. Four years later, the Redskins won their first 11 games before finishing the season 14–2, and cruised through the playoffs with home victories over the Atlanta Falcons (24–7) and Detroit Lions (41–10). In Super Bowl XXVI, the Redskins were up 24–0 on the Buffalo Bills just sixteen seconds into the third quarter, and 37–10 with over eleven minutes to go when Gibbs pulled most of his starters. The Bills would score two cosmetic touchdowns for a final score of 37–24. The victory gave Gibbs and the team their third Super Bowl title. Gibbs returned for the 1992 regular season to defend the Redskins' Super Bowl crown from the previous year. The Redskins finished with a lesser record at 9–7 and 3rd place in the NFC East. They needed a bit of help to make the playoffs and they got it after a loss by the Green Bay Packers got them in as the last Wild Card entry. In the Wild Card round, the Redskins defeated the Minnesota Vikings on the road, by the score of 24–7, however they would fall in the Divisional Round to the San Francisco 49ers in a road game by the score of 20–13, ending the Redskins' hopes of retaining their Super Bowl crown. Two months after Super Bowl XXVII, Gibbs retired on March 5, 1993, surprising many in the organization and around the league. Center Joe Bostic called it "probably the biggest shock I've gotten in my life." A notorious workaholic, he had begun to suffer health problems, and he cited a desire to spend more time with his family. From 1994 to 1997 Gibbs served as a color analyst on NBC Sports' NFL pregame show. In 1996, Gibbs was enshrined in the Pro Football Hall of Fame. He was one of the winningest coaches in the NFL, with a record of 124 wins and 60 losses, and a post-season record of 16 wins and five losses. His combined winning percentage of .683 was third all-time (behind Vince Lombardi and John Madden). In his 12 seasons so far, the Redskins won 4 NFC East titles, reached the playoffs 8 times, and finished with a losing record only one season (7–9 in 1988). Gibbs is the only NFL coach to win three Super Bowls with three different quarterbacks and three different starting running backs. Although Gibbs helped craft a passing-oriented attack during his time in San Diego, his Redskins teams incorporated a smash-mouth, rushing-oriented attack called the counter trey. By building a strong offensive line (known as "The Hogs") Gibbs was able to control the line of scrimmage, allowing workhorse running backs John Riggins, George Rogers, and Earnest Byner to power the ground game. Gibbs added a deep passing attack which complemented the ground game, utilizing agile receivers such as Art Monk, Gary Clark, and Ricky Sanders. Gibbs' offense was aided by aggressive defensive units under the direction of defensive coordinator Richie Petitbon. Gibbs' system was robust enough to be successful without a Hall-of-Fame-caliber quarterback at the helm. The Redskins' Super Bowl victories were won featuring Joe Theismann, Doug Williams, and Mark Rypien—capable players who were very successful along with their strong supporting cast. Gibbs is credited with inventing the single back, double or triple tight end set. He used it to neutralize Hall of Fame linebacker Lawrence Taylor, realizing that to successfully block him with a running back was impossible. An extra tight end and a tackle were required as well. The extra tight end provided additional protection for the quarterback. Gibbs was also credited for creating the Trips formation: stacking three wide receivers to one side. Gibbs incorporated shifts and motions for which his offenses were known. The formations created mismatches and confused the opposing defenses which were subsequently exploited. He is one of few coaches that utilized the H-back position prominently in his offense. Gibbs created his NASCAR team, Joe Gibbs Racing in 1992, a year before he first retired from the NFL. The first driver for his team was Dale Jarrett (1992–1994), with the sponsor Interstate Batteries, and the number 18. His son, J. D. Gibbs, was the president of Joe Gibbs Racing and oversaw daily operations of each of the teams since his father's return to the NFL. The team currently fields four cars in the Monster Energy NASCAR Cup Series and three in the Xfinity Series. No. 19 Martin Truex Jr.
Yates would bring home 2 NHRA Winston Pro Stock Championships in 1996 and 1997. McDonald's was the primary sponsor on all three cars from 1995 to 1997. In 1998 Cruz Pedregon would be sponsored by Interstate Batteries and Jim Yates by SplitFire. Pedregon won Gibbs' first NHRA National Event as a team owner at the 1995 NHRA Chief Auto Parts Winternationals. He would couple that with a victory at the '95 NHRA U.S. Nationals, 3rd for Pedregon in 4 years at the U.S. Nationals. Pedregon continued to race for Gibbs until mid-season (Englishtown, New Jersey) in 1999. Ending with a final round appearance, Pedregon left to race on his own, and was replaced by Tommy Johnson Jr. Johnson Jr. would win his first Fuel Funny Car win with Gibbs at the '99 NHRA Keystone Nationals and would go to the next two final rounds, scoring another victory in the process. It was announced that after the '99 season, Gibbs team would be reduced to a two-car team, and the Funny Car team was parked from then on. McClenathan finished 2nd in NHRA Winston Top Fuel points in both 1997 and 1998 with Gibbs. In 1997, McClenathan went on a hot streak, sweeping the famed Western Swing (Denver, Sonoma, Seattle) and a total 4 wins in a row, 5 in 6 races since Denver, including a final round at the U.S. Nationals in '97. He also took Gibbs' MBNA Top Fuel Dragster to a $200,000 pay day, winning the 2000 NHRA Winston No-Bull Showdown, pitting Top Fuel Dragsters against Funny Cars in a 24 car shootout. Gibbs announced that he would focus solely on his NASCAR teams following the 2000 season, ending the 6 year long relationship with NHRA. In 2008, Gibbs branched out into motorcycle racing, forming the JGRMX team competing in the AMA motocross and supercross championships. The team is based in Huntersville, North Carolina and is managed by Gibbs' son, Coy Gibbs. Throughout his retirement, many NFL owners approached Gibbs hoping to lure him out of retirement, but to no avail. Some owners even offered to move his entire NASCAR racing team to their team's city if he came back. The only team he seriously considered coming back for was the Carolina Panthers when they first joined the NFL as an expansion in 1995. However, he did not believe he would be able to manage his time between his race team and coaching. In 1999, he was part of a group that was trying to buy the Redskins but ultimately failed. In 2002, Gibbs and a small group of investors bought five percent of the Atlanta Falcons from owner Arthur Blank for $27 million. It wasn't until late 2003 when Gibbs really started to catch the football fever again. Blank and his general manager, Rich McKay moved quickly to interview him for the Falcons' vacant head coaching position due to the firing of Dan Reeves. However, when Gibbs found out that Steve Spurrier resigned as the Redskins' head coach, they realized that even though Gibbs was one of the team's minority owners, his loyalty still lies with the Redskins. It is well documented that Daniel Snyder had been turned down by Gibbs several times before. On December 31, 2003, Snyder's private plane (Redskin One) was spotted at an airport outside of Charlotte, North Carolina. After spending 11 years in retirement from the NFL, Snyder successfully lured Gibbs out of retirement. Gibbs' change of heart was quite a surprise to the football and NASCAR worlds. During his January 7 press conference, a visibly emotional Snyder welcomed him back. Gibbs then stated that even though he enjoyed NASCAR immensely, he had missed coaching in the NFL. And although he had fielded offers in the past, he could only see himself coaching for the Redskins. Because of his credibility, Gibbs was able to assemble one of the largest and most experienced coaching staffs in the NFL. Many coaches from his previous tenure with the team returned with Gibbs as well, including offensive line coach/assistant head coach Joe Bugel, offensive coordinator Don Breaux, quarterbacks coach Jack Burns, and tight ends coach Rennie Simmons. Gibbs was able to lure former Buffalo Bills head coach Gregg Williams to join the Redskins to run the defense and hired one of his former running backs, Earnest Byner, to serve as running backs coach. Overall, many of his assistant and position coaches were either former head coaches and/or held top assistant coaching positions with other NFL teams. Gibbs left his racing team in the hands of his eldest son, J.D., while his other son, Coy, joined him as an assistant with the Redskins. In 2004, Gibbs had what was, up to that point, the worst season of his career with a 6-10 finish. However, the team did finish the season on a high note with a 21-18 victory over playoff-bound Minnesota. The defense also finished the season ranked third in yards allowed. Hoping to improve on the previous season's dismal passing attack, Gibbs added former Jacksonville Jaguars offensive coordinator Bill Musgrave as his quarterbacks coach. Having coached new Redskins quarterback Mark Brunell when they both were in Jacksonville, they easily formed a rapport. Musgrave's input allowed the Redskins add a few new wrinkles to their playbook. For the first time under Gibbs, the Redskins offense utilized the shotgun formation. In the wild-card playoff game, Gibbs led his team to a 17–10 victory over the Tampa Bay Buccaneers, to whom the Redskins suffered a 36–35 defeat earlier in the year. In the next round of the playoffs, however, the Redskins could not replicate their early-season victory over the Super Bowl-bound Seattle Seahawks, and lost to the eventual NFC Champion by the score of 20–10. During the 2006 off season, Gibbs hired Kansas City Chiefs' offensive coordinator Al Saunders to be associate head coach – offense for the Redskins. Saunders came from a similar background as Gibbs, as both learned under Don Coryell. Saunders experienced great success at the helm of the Chiefs' offense with a team that lead the NFL in total yards and scoring over a five-year period and was named USA TODAY's Offensive Coach of the Year in 2005. He took over for Gibbs as the team's primary play-caller upon joining the Redskins. This allowed Gibbs to focus more on his role as head coach and CEO and devote more time to personnel matters, defense, and special teams. Gibbs also added former Buffalo Bills defensive coordinator Jerry Gray to his staff as secondary/cornerbacks coach. However, Gibbs did lose quarterbacks coach Bill Musgrave to the Atlanta Falcons over the summer of 2006. The 2006 season was disappointing for Gibbs. The Redskins finished 5–11, the team's worst regular season record under Gibbs' leadership thus far, and placed near the bottom in the NFL in defense. On the bright side, though the '06 Redskins boasted the league's 4th best rushing offense despite losing starting tailback Clinton Portis to injury and saw continued improvement from young starter Jason Campbell, who capped off 2006 with a strong performance against the Giants, in which he posted a QB rating of 96.2. The Redskins qualified for the playoffs in 2007, for the second time in 3 years, following the completion of a 9–7 regular season. They advanced as the sixth-seeded team in the NFC, and were defeated by the NFC West Division champions Seattle Seahawks in the first round of the playoffs. The team suffered a notable tragedy when star safety Sean Taylor was murdered in his home the night after game eleven. Shot during a burglary attempt during the early hours of Monday, November 26, 2007, Taylor died the following day. Taylor's funeral was held on Monday, December 3, 2007, between games 12 against Buffalo (Sunday, December 2) and 13 against Chicago (Thursday, December 6). The Redskins concluded the season with four straight victories led by back up quarterback Todd Collins. Prior to the run, the Skins were 5–7 and, in addition to suffering through the Taylor tragedy, the team had lost starting OG Randy Thomas, OT Jon Jansen, CB Carlos Rogers, OLB Rocky McIntosh, and QB Jason Campbell to injury. Despite all this, Gibbs led Washington to the playoffs. In what has been referred to as Gibbs' finest month of coaching ever, many players credited Gibbs' will, leadership and inspiration to guide the team on their late season winning streak. Gibbs retired as head coach and president effective January 8, 2008 after completing four years of his five-year contract. His retirement came three days after a first round playoff loss to the Seattle Seahawks, which concluded the 2007–2008 season. 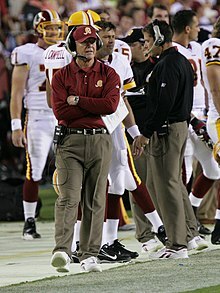 The last game he coached at FedEx Field in Washington was on December 30, 2007; the Redskins had a key victory over the Dallas Cowboys to send Gibbs and the Redskins to the playoffs. He remained with the team as an adviser to team owner Daniel Snyder. During Gibbs' four-year return to the Redskins, the team qualified for the playoffs twice, once more than it qualified for the playoffs during his eleven-year absence. He was succeeded as head coach by Jim Zorn. When Gibbs was the offensive coordinator of the San Diego Chargers under Don Coryell in 1979 and 1980, Coryell would have the Chargers wear white uniforms for home games in San Diego. So, during both of his stints as Washington's head coach, Gibbs started the tradition of having the Redskins wear white uniforms over burgundy pants for all their home games. The Redskins also sported white over burgundy on the road whenever the opposing home team decided to wear dark colored jerseys. This uniform combination is considered to be the team's "classic" look. His teams almost exclusively wore their burgundy uniforms over white pants for road games at Texas Stadium against their archrivals, the Dallas Cowboys. The Cowboys, like the Redskins, primarily wore their white uniforms for their home games. The only time Washington wore the white over burgundy combo at a road game in Texas Stadium during Gibbs' tenure was in 2005. That year, the Redskins recorded a 14–13 victory over the Cowboys, who were wearing their blue throwback uniforms. However, in all of Gibbs' 16 seasons as coach of the Redskins, the team never wore its burgundy jerseys at home. 8 1 0 .889 1st in NFC 4 0 1.000 Super Bowl XVII Champions. 14 2 0 .875 1st in NFC East 2 1 .667 Lost to Los Angeles Raiders in Super Bowl XVIII. 11 5 0 .687 1st in NFC East 0 1 .000 Lost to Chicago Bears in NFC Divisional Game. 12 4 0 .750 2nd in NFC East 2 1 .667 Lost to New York Giants in NFC Championship Game. 11 4 0 .733 1st in NFC East 3 0 1.000 Super Bowl XXII Champions. 10 6 0 .625 3rd in NFC East 1 1 .500 Lost to San Francisco 49ers in NFC Division Game. 14 2 0 .875 1st in NFC East 3 0 1.000 Super Bowl XXVI Champions. 9 7 0 .562 3rd in NFC East 1 1 .500 Lost to San Francisco 49ers in NFC Division Game. 10 6 0 .625 2nd in NFC East 1 1 .500 Lost to Seattle Seahawks in NFC Division Game. 9 7 0 .534 3rd in NFC East 0 1 .000 Lost to Seattle Seahawks in NFC Wild Card Game. Gibbs currently resides in Charlotte, North Carolina, with his wife, the former Patricia Escobar. They have two sons, J. D. Gibbs and Coy Gibbs, and eight grandchildren. J. D. and his wife, Melissa, have four sons: Jackson, Miller, Jason, and Taylor. Coy Gibbs and wife Heather have three sons Ty, Case, Jet, and daughter Elle. In January 2007, Gibbs revealed that Taylor was diagnosed with leukemia, adding that his grandson had undergone surgery and received chemotherapy treatments. Gibbs is a devout Christian. His son J.D. died on January 11, 2019 after a long battle with neurological brain disease diagnosed in 2015. On September 5, 2008, Gibbs addressed the 2008 Republican National Convention, during which he offered his support for John McCain and his hope that the McCain-Palin ticket would lead to a 'spiritual awakening' in the United States. Gibbs has long been open about his Christian faith, but notoriously reserved about articulating his political positions, because, as the old Washington joke goes, "The Redskins are the only thing that unites the town." As one of the most sought after A-List figures in Washington social circles for over a quarter-century (and even being referred to as "the most popular man in Washington" by the Washington Post), Gibbs admitted being uneasy addressing the convention, stating that it was "a little awkward to put on a partisan hat." In 1992 Gibbs co-authored Joe Gibbs: Fourth and One, and in 2003 he co-authored Racing to Win. The books resemble a business and life how-to book and motivational guide as he discusses his successes and mistakes in his career, offering the lessons he learned as tips to the readers. In 2009, Gibbs wrote the book Game Plan for Life which discusses his life in football; how his faith in God can help others and outside of the sports as well as key topics that are important to today's men and women trying to lead a Christian life in today's world. www.gameplanforlife.com. ^ a b "Gibbs' deal more lucrative than Spurrier's". ESPN.com. January 7, 2004. ^ "Gibbs cites pull of family obligations for retiring from Redskins". ESPN.com. January 8, 2008. ^ "Gibbs Hired as Redskins Coach After Meeting With Cooke". Washington Post. January 13, 1981. ^ "Super Bowl XXV". Baltimore Sun. Retrieved September 15, 2010. ^ "Some players saw hints that coach might quit JOE GIBBS RETIRES". Baltimore Sun. Retrieved May 3, 2017. ^ a b "NASCAR drivers, Joe Gibbs get behind Supercross". usatoday.com. Retrieved June 28, 2016. ^ "JGRMX Team". jgrmx.com. Retrieved June 28, 2016. ^ Friend, Tom (January 28, 1996). "Dierdorf And Gibbs Lead Five Into Hall". New York Times. ^ "NFL football news, rumors, analysis". Pro Football Weekly. Archived from the original on March 6, 2005. ^ Battista, Judy (January 9, 2008). "Redskins' Gibbs Retires After a Trying Season". The New York Times. Retrieved April 2, 2010. ^ "White at Home in the NFL". Uni Watch.com. Archived from the original on July 16, 2011. ^ "Gibbs's Grandson Has Leukemia". The Washington Post. January 24, 2007. Retrieved April 2, 2010. ^ "J.D. Gibbs, 49, dies after battle with neurological disease - NASCAR.com". Official Site Of NASCAR. January 12, 2019. Retrieved April 15, 2019. ^ "Joe Gibbs: Redskins on the right path under Mike Shanahan". USA Today. March 18, 2010. Retrieved May 6, 2010. ^ Carpenter, Les (January 9, 2008). "Redskins' Gibbs Resigns As Coach". The Washington Post. Retrieved April 2, 2010. ^ "Library of Congress Online Catalog". Retrieved February 12, 2008. Wikimedia Commons has media related to Joe Gibbs.